Yangon began the City Cancer Challenge process in July 2017, with an initial meeting to formally establish the City Executive Committee and outline the City Cancer Challenge Process. The multisectoral committee includes representatives of the Ministry of Health and Sports (MoHS), the Yangon Region Government, Myanmar Medical Association, Myanmar Oncology Society, Shwe Yaung Hnin Si Cancer Foundation, U Hla Tun Cancer Foundation, Yangon General Hospital, Central Women’s Hospital, Yangon Children’s Hospital and the Myanmar Private Hospital Association. Work has advanced significantly since the first meeting, thanks to high-level support from key stakeholders and lessons learned in other City Cancer Challenge cities in Latin America - Cali and Asunción. The City Executive Committee worked together cohesively on an in-depth situation analysis for Yangon. This analysis is a robust needs assessment that provides an accurate picture of a city’s current cancer treatment and care offering, and is a critical step in the City Cancer Challenge process. Yangon is Myanmar’s largest city and main commercial hub, with a population of 7.36 million. Around 59 per cent of deaths each year are attributed to non-communicable diseases (NCDs), including 11 per cent specifically to cancer. The city of Yangon is overwhelmed by cancer care needs from surrounding regions. The city’s resources exist to help millions of people within the city, but also regions around Myanmar. The estimated reach for the region’s cancer support extends to about 16.61 million people. Yangon faces significant challenges in the availability of physical infrastructure, essential medicines and health information systems. 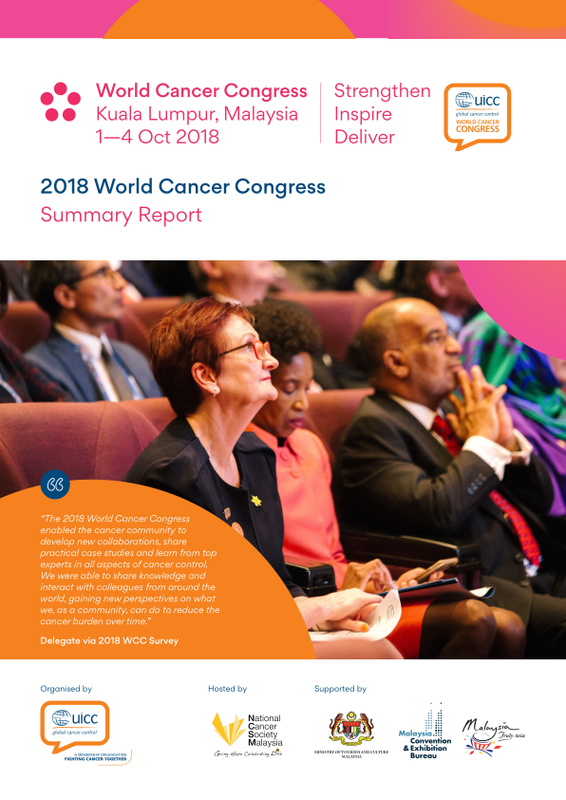 The number of qualified health professionals to address the region’s cancer burden is inadequate – and very high out-of-pocket costs exist for the treatment and care of cancer patients. A total of 19 public and private cancer care providers across the city contributed to the needs assessment process, providing in-depth information on the availability and quality of cancer services, and community access to integrated care networks operating in Yangon. Importantly, the needs assessment process included integrated perspectives from three distinct groups (civil society, patient perspectives, and institutional staff perspectives) to get the full picture of the perceived services in the referral network. First, a collation and review of data from all participating health facilities by topic (eg. palliative care, pathology and clinical laboratory) was undertaken by a multi-disciplinary Technical Committee of local health experts. The diagnostic reports were presented to the City Executive Committee for feedback, and used to develop a situational analysis report. In January 2018, the Members of the City Cancer Challenge Technical Committee and City Executive Committee for Yangon came together at the third City Stakeholder Meeting to share their findings from the detailed needs assessment process. The technical committees discussed the emerging priorities for improving access to quality cancer treatment and care in Yangon – and the following interviews showcase their learnings and progress so far. From the needs assessment, what has the Yangon City Executive Committee learned about cancer in the region? What struck me most is that there is a lot of overarching needs regarding cancer early diagnosis, treatment and survivorship. From the patient’s perspective, the assessment covered in detail the access to health services, cancer care experiences and access to health insurance and cost of care. I am very optimistic about what City Cancer Challenge is able to do… on the other hand I realise that not all our needs can be met in a certain timeframe – but what I expect is the most pressing needs will be covered – especially access to cancer services, where the wait time is very, very long. How will patients and the community be impacted by this work? I think the patients and the community will benefit greatly from the City Cancer Challenge project. We have seen the commitment from both the Yangon Regional Government and the Ministry of Health and Sports to work together with all stakeholders, which will surely make a difference in cancer treatment and care for the community. What are the challenges of serving so many people in Yangon, and throughout the region? In addition to the large population served by Yangon, the most pressing problem is the issue of urban migration, overcrowding and poverty resulting in the vicious cycle of increased exposure to risk of cancer, lack of access to affordable healthcare, and economic hardship. Most people cannot afford the cost of treatment for cancer and resort to traditional medicine – resulting in presentation at a late stage with dire consequences. Public hospitals – especially those treating cancer – are overwhelmed and have difficulties coping with the huge number of cancer cases. This results in long wait times, especially for radiotherapy. Most government-supplied drugs run out in a few months, and many have to bear the cost of oncology drugs out-of-pocket. There may be challenges, but also a great opportunity to make a difference in the lives of many through City Cancer Challenge - what do you see as the opportunities? The commitment by the Yangon Regional Government and the Ministry of Health and Sports to support the City Cancer Challenge initiative has been strong, and the participation of all stakeholders in the process for formulating the programme will make a difference not only in improving access, but also in providing quality services for cancer patients. I think the major benefit from City Cancer Challenge is the ability of its international partners to enter Myanmar and work together with the private sector, as well as government, in the field of cancer diagnostics and treatment. City Cancer Challenge offers opportunities for developing the human resource capacities of Myanmar in the field of cancer, both in quantity and quality aspects and also creating national standards in respective disciplines for cancer treatment and care, and setting up of a population-based cancer registry for Yangon Region. What you’re doing here will influence other cities around the world – what advice would you give to others starting the City Cancer Challenge? The advice is that an assessment is very crucial, when you do the assessment properly, I think the chart will be more clear, and when we are setting objectives, it will help a great deal. It is very systematic – and the assessment tools that were provided by City Cancer Challenge, have been a great help to us. The whole process has also been a learning experience for us. We have never been taken through a whole process like this, and this kind of planning. Speaking from the patient perspective, why do you think City Cancer Challenge is so important, and what can City Cancer Challenge do to better serve the patients of Yangon? Cancer knowledge and health literacy in Yangon is more or less poor. Patients may come in with late stages of cancer, so we want to move forward with quality cancer care. We want to get a good clinical outcome, we want patients presenting at the early stage of the disease, and we want to enhance the cancer knowledge of the patient. City Cancer Challenge, as far as I’m concerned, is important for the quality cancer care of the patient – starting from the diagnosis, and surgery, medical oncology, radiation oncology, and as well as for survivorship – so the whole cancer continuum is involved for the cancer patient. Yangon has gone through a needs assessment and situational analysis, and now the main advantage is that we can sit together on the one table – it’s multi-stakeholder involvement. Not only the government, not only the private, not only the NGOs – we come together and sit, for the first time, because of City Cancer Challenge. I would suggest the most important thing is collaboration and cooperation of multi-stakeholders locally, and also the political commitment. Tell us more about the importance of multi-stakeholder involvement through this process - we understand this is a ‘first’ in many ways for the city of Yangon? If we look at the cancer care continuum, it is evident that there are many stakeholders involved in providing preventive, curative and rehabilitative services. No one organisation or institution can cover the needs of cancer patients. So, it is imperative that as many stakeholders are involved when we consider a plan as possible, especially in this instance: for early diagnosis, treatment and survivorship. This is the first time that multi-stakeholders: government institutions, private sector health care providers dealing with cancer, non-governmental organisations working in the field of cancer, hospices providing palliative care, including end-of-life care, patient support groups, cancer survivor groups and cancer patients themselves have provided their perspectives in the initial assessment survey that was carried out in Yangon. What is your advice for other cities now joining City Cancer Challenge? 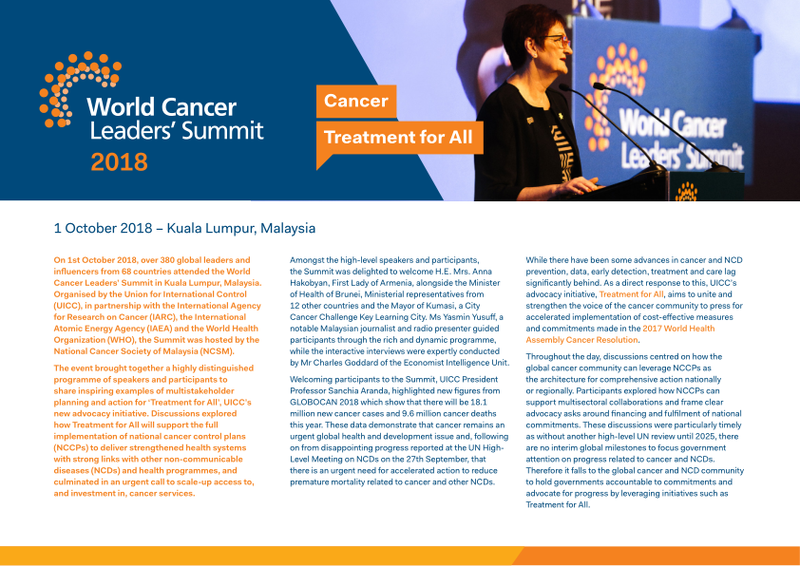 I would urge other cities to mobilize as many relevant key stakeholders as possible – all voices need to be heard to gather a wide and diverse perspective of the problems relating to the early diagnosis, treatment and survivorship of cancer. We need to have an open mind, free from pre-formed ideas or biases, and patience. Egos and personalities need to be put aside and we need to just focus on the good that can be done for common good of the people, which will help bring everyone on board. I think working with many stakeholders will result in making us think ‘out of the box’ and to find innovative ways to resolve some of the issues. How do you think City Cancer Challenge will change cancer care in Yangon? I hope from City Cancer Challenge, that especially in cancer treatment and in radiation oncology for Yangon – we will change, with more advanced techniques, and we can learn more – that there will be further training for junior colleagues and human resources development. What do you think are the biggest challenges that City Cancer Challenge and the Committee need to overcome? In our city, the population is so big, and many people are migrating to the region, so the big challenge is that we need more infrastructure and facilities, especially in radiotherapy – including machines. We need help with our cancer registry and medical oncology – including more drugs for cancer patients. With the needs assessment complete, the City Executive Committee is now focused on translating the findings into a city activity plan, identifying high-level objectives, sub-objectives, activities, and timelines. The result will be a set of concrete recommendations for priority needs and actions, which the committee will lead with the strong support of City Cancer Challenge, regional experts and a global network of partners. The City Executive Committee in Yangon hope their experience will inspire and guide other Challenge Cities in future, leading to lasting change and improved cancer care and treatment for regions around the world. Along with the development of the city activity plan, work is continuing across Myanmar to finalise a way forward based on the most pressing cancer control needs in Yangon – including identifying sustainable financing solutions with support from City Cancer Challenge. *City Cancer Challenge is committed to support 20 cities around the world to take the City Cancer Challenge by 2020. Through the City Cancer Challenge process, cities will conduct a comprehensive needs assessment, identify priorities, and make plans to improve cancer care and treatment for their people.